Plain yogurt is a truly amazing food. It's full of vitamins and minerals and it also contains helpful bacteria that are very beneficial to gut health. It's affordable and even super simple to make yourself as demonstrated in my post HERE. Most of the yogurt available at the grocery store is heavily sweetened and has flavors added to it, making it more of a dessert than a health food. A lot of people just can't get past the tangy, sour flavor of plain yogurt. It's a bit of an acquired taste. So today, I want to show you 10 ways that you can incorporate plain unsweetened yogurt into your meals. 1. Replace the mayonnaise in your macaroni or potato salad with plain yogurt. It will still give you the delicious tang and creamy texture. Add a little bit of salt and a squirt of mustard and you'll have a salad that is delicious as well as nutritious! 2. Put a dollop of plain yogurt on top of your baked potato. You may have noticed that plain yogurt tastes a bit like sour cream and it makes an awesome lower fat replacement for it on baked potatoes! 3. Add it to your morning smoothie. It will add that creamy texture and satisfying flavor that will keep you craving more every morning! 4. Do you love tuna or salmon sandwiches? They are such a quick and easy lunch during the busy work week. Swap out the mayo or Miracle Whip for an equal amount of plain yogurt. It's just as delicious! 5. Make a mango lassi! Have you ever had a mango lassi at an Indian restaurant before? They're delish and so easy to make. Just blend together some yogurt and fresh mango. Add a bit of water until you reach your desired thickness! Yum! It's cool, creamy, and perfect for a summer's day! 6. Make popsicles! Mix yogurt together with orange juice and pour into popsicle molds and put them in the freezer. I like to use the orange juice with pulp! Now you will have a delicious and sweet frozen treat whenever a craving strikes! In case you were wondering, freezing does not destroy the beneficial bacteria in yogurt. It just puts them into a dormant state. They will come back to life again once they are warmed up in your body. Isn't that cool? Or should I say warm! 7. Make a healthier frosting for cakes and cupcakes. The best part is that it's actually super delicious too! Check out this incredibly easy recipe by The Cupcake Project by clicking HERE. 8. Whip up a pot of chocolate pudding. Sometimes you just want pudding, why not add a healthy kick of Greek yogurt while you're at it? You won't even know it's there! Here's an easy recipe from Cabot Cheese. Click HERE. 9. Do you like perogies? I do too. I have loved them since I was a small child. I always enjoyed them with a side of sour cream. If in don't have sour cream on hand and have a craving for perogies, I just sub the sour cream with plain yogurt. It works really well and I hardly notice the difference. 10. Make an awesome veggie dip. Just mix some dill, garlic, salt, and a squeeze of lemon to some plain yogurt and you will have a super simple dip for veggies or chips! 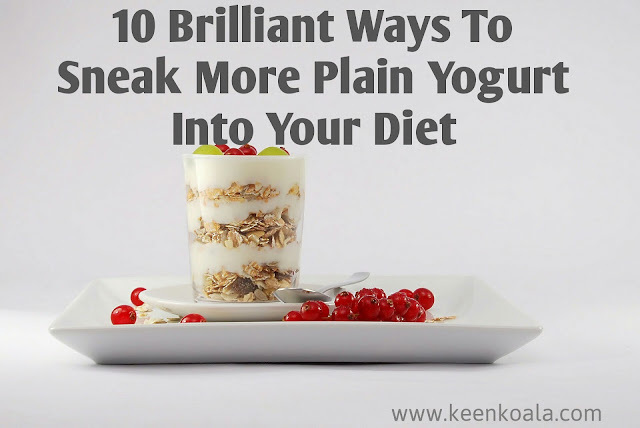 How do you like to use plain yogurt? Do you have any other ideas that I didn't mention? Let me know in the comments section below! Like us on Facebook for instant access to the latest posts, exclusive content and contests by clicking HERE!